This is Chouette, Cleddau and Tentatrice all together for the first time in two years. The first thing we had to do this morning was go up one lock, wind (turn), go down the lock and the head off back the way we came on Sunday. Sue and I headed off across the fields to visit the NT property Little Morton Hall, but first we had to run the gauntlet of these ladies and their offspring. They were standing right in the middle of the path - we had headed off to skirt round them, when some people coming the other way went right through them, so we followed suit. We are both people who would prefer a fence between us and a herd of cows! We made it safely. This is Lower Moreton Hall built in the 1500's and everything is as it was all those years ago. Nothing about this property is straight. We arrived just as a guided tour was starting - good timing on our part. This table is a another piece that dates back to the 1500's. Things inside are no straighter than the outside. In this room the fireplace is the only part that is true. If you stand with your back to the wall opposite the window, fix your eyes on a part of the window and walk forward you really do feel as though you are going downhill. And also the folly at the top of Mow Cop - another sight that is often obscured by clouds. Today was a day of bits and pieces that seemed to go on and on. We set off around 09:30. Monty and I went ahead on foot heading for the water tap at Hall Green. On the way we passed Chouette at her home mooring and bade them farewell. On we went to Hall Green to find that there were two boats there already - one filling with water and one waiting. It took around an hour before we had both had our turn with the tap and could be on our way. Cleddau went ahead and by the time we left there were no boats for water or the lock!! From there it was back on to the Trent and Mersey, but this time we turned left and continued northwards. There are several sets of locks and most are a pair of locks. It managed to confuse Monty who was used to the boats sharing the same lock last year, but now we had one each! We stopped at Tesco's and both had so much heavy shopping we decided to get a taxi back. It was not far - the fare was just £3, but it was really well worth it. The taxi driver was probably the best I have ever come across. Not only did he pack all the bags into his boot, but he got out and carried four bags down the tow path to the boats. Needless to say he got a good tip. We initially moored two locks up, but when someone came and said that the lock below us was leaking water and we realised the pound was going down as we watched it. We went and looked and sure enough water was pouring through the hinge area of the top gates. So it was a case of' Action Stations' and all hands on deck as we made the decision to move down two locks rather than risking ending up in a dry pound by the morning. It meant we went from good moorings on rings to a rather overgrown towpath edge and having to put pins in for the first time this trip. It also meant a late dinner, but we do have lots of water under the boats, so we should still be afloat in the morning. I was a bit late capturing the sunset tonight (blame the move), but I hope it bodes as well for tomorrow as yesterday's did for today, although the weather forecast has just promised us rain in the morning. And this was noted en route - added for one of our grandsons, but I hope he is never Lonesome. The 'smashing' day actually started the evening before when Chris knocked a wine glass off the table. Thankfully he had thoughtfully emptied it first, but it still took ages to clear up to ensure no glass was left to get into Monty's paws. Then very shortly afterwards it was my turn - I dropped a small glass dessert bowl whilst washing up, so the clear up process was repeated all over again! I did suggest we should break a match to ensure three breakages, but despite not doing so I am glad to say everything else on the boat remained intact that evening! And so to the next day which dawned dry if a little overcast. We were up bright and early and ready to go through the tunnel by 08:15 as requested the night before. We had read the instructions (they do appear at all tunnels on the canal network) and were all kitted out in waterproofs (tunnels are usually very wet) and life jackets. The tunnel keeper came across with more instructions which mainly related to what to do if anything goes wrong - a long blast on your horn every 30 seconds until you hear the answering three quick blasts when they will send a rescue party. Is it like this at every tunnel? No most do not have tunnel keepers at each end. A lot are wide enough for two way traffic and those that are too narrow are short enough that you can check visually to see if it is clear. At this tunnel it is one way and is strictly controlled. The other issue is that in some places the roof is very low, so care is needed to ensure you don't bang your head. Tragically a couple of years ago and man died in this tunnel. His wife was inside (my place of choice in a tunnel) when she realised the boat was banging the sides, so she went to check and her husband had gone. They think he must have banged his head, been knocked off unconscious and subsequently drowned. Hence the advice to wear a life jacket. Because of this I decided I should stay out on the back deck with Chris. At 08:25 we were off with our air horn ready as our boat horn was deemed not to be loud enough to hear. The gate was opened and off we went and easily cleared the gauge. Once you are in, the gate is closed behind you. They will allow up to 8 boats at a time to transit, but we were on our own. 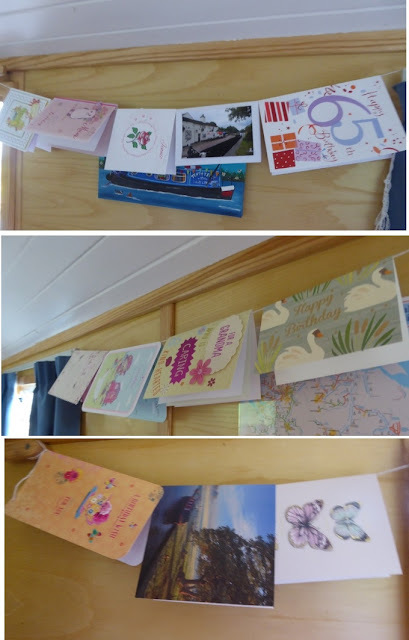 I also hung up my cards - extra string was needed this year. As we neared the other end Monty and I went back onto the deck and we very soon emerged safely and bade farewell to the tunnel keeper at the north portal. It took us a little over 35 minutes. If you have not appeared after 1.25 hours they will come in to look for you. The first thing you notice on exiting is the very red water. Turn left and onto new waters for Tentatrice. We were here 22 years ago on a hire boat, but have very little memory of it, so effectively new waters for us as well. There is one very shallow stop lock with a very narrow exit going south; entrance for us going north. We did not want any 'smashing' here, so Chris kept well back until they had exited and were clear. The visual delights were indeed 'smashing'. This row of cottages could almost be described as Neapolitan had the middle cottage been a little browner! And the pink one is called 'Teapot Hall'! With these magnificent railings on the towpath side. 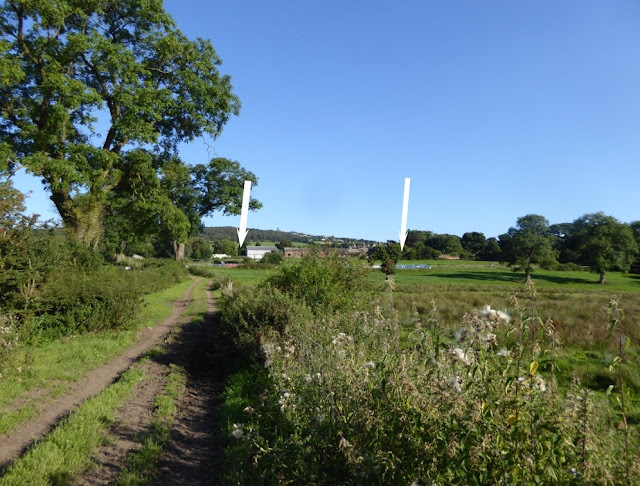 They were beautifully restored to their former glory in 2008/2009 with money from the Macclesfield Canal Society and British Waterways. And indeed one might say it is 'smashing'! There are several narrow parts on this canal and almost invariably it is where you meet oncoming traffic. And who could resist such a view? Sue and Ken from nb Cleddau have been here since Friday and are helping out at the 'Halous' event as members of the Macclesfield Canal Society - this has been held at the 12 Bosley locks for the last 24 years. They aim to have 1 to 2 volunteers on every lock on the Saturday and Sunday of the August Bank Holiday weekend. Monty and I left Chris with the Sunday paper (and to have a nap!) whilst we walked up the flight and there at lock 5 we found Sue. 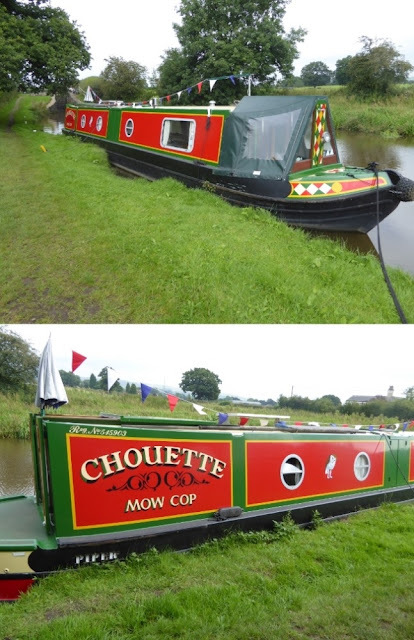 Also present at the event (well running it) were Patrick and Angela from nb Chouette (seen here looking very smart after a re-paint earlier this year). They were the third boat in our convoy across the Wash two years ago. The day ended on board nb Cleddau celebrating my birthday and our 'Wash' reunion with some champagne from a Gloucestershire vineyard - a birthday gift to me from our friends Jane and Chris who did so much for us last week - thank you both - it was very good. Inevitably we did not manage one good photo of all of us, but this was the best of the bunch. From the left - Angela, Sue, Me, Patrick and Ken. Had we not had the problem with our batteries we would not have come this way. It was a truly 'smashing' day, so maybe the delay was for a good reason. You win some you lose some! A queue or two - or maybe more! What do you call a queue?